The Citroen Kegresse P.7.T is a Rank I French self-propelled anti-aircraft gun with a battle rating of 1.3 (AB/RB/SB). It was introduced in Update 1.75 "La Résistance". With its four 13.2 mm Hotchkiss Mle.1930 machine guns, it poses a certain threat to enemy aircrafts while featuring poor mobility (off-road) and armour. The P.7.T AA is a very classic interwar anti-air defense system with its guns mounted on a mobile but vulnerable chassis. With only 3 exposed crew members, anything can damage, disable or destroy this vehicle. Its armour does not provide enough cover to the crew from any angle. 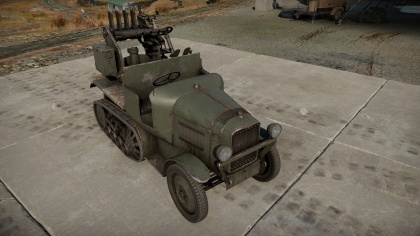 Even .30 cals guns can easily destroy this vehicle, so be sure to stay out of sight from enemies. The half-track configuration usually provides increased off-road mobility to wheeled vehicles while enabling to carry more weight over the tracked section, a rule to which the P.7.T AA is no exception: It can reliably move itself across any rough terrain. The only downside to this vehicle is its low HP, which makes hill climbing quite slow. This little engine also struggles to bring this much weight to its max speed: One should go downhill and hit the gas in order to reach 40 km/h. Turning on the spot is also a no-go since tracks do not provide enough traction to the ground: Hit the forward key and gain some speed before attempting any manoeuvre. Be patient and choose your path wisely and you should reach your destination soon enough. With its four HMGs, this SPAA is quite reminiscent of the GAZ-AAA (4M) while having much more firepower. Since these weapons fire simultaneously, one hit usually means four holes in your opponent's hull, a heavy toll to the early planes (and biplanes) you should be shooting at this BR. Saying that the P.7 has armour is an insult to armour. The thickest plate of steel it carries is 20 mm, and that's not even on a part that is designed to take damage. Every crew member is exposed, and even 7.62 rounds will deal critical damage to both the crew and the vehicle. Not only is this bad for engaging tanks (which you shouldn't really do anyways with it), but it means that you are very vulnerable to aircraft return fire and bombs. However, this shouldn't be a problem, as you should be able to destroy aircraft making a bee-line for you before they can accurately target you. The mobility is above average and smooth overall, while no terrain poses a challenge due to the half-track system. Due to the relatively high potential speed, the P.7 can quickly get into an advantageous position on the map to shoot down planes. Just be sure to keep an eye out for flanking light tanks or fast medium tanks such as the Panzer 3 and 4's, as anything can annihilate you. The quad 13.2 mm Hotchkiss HMG's are fantastic at shredding planes and start fires very easily due to the belts containing pure API rounds. With their above-average fire rate, high damage, good accuracy and decent reload speed, they are an AA jockey's dream. It is worth noting that they have a limited magazine capacity, only 30 rounds per gun, but this is more-or-less remedied by the fact that there are 4 guns, allowing for 120 rounds total. However, due to the P.7's low BR, they can be decent at destroying reserve and 1.3 tanks from the sides and rear. It is not recommended to use it in this fashion, as you leave yourself as an easy target for anything with guns. Ammo racks of the P.7.T AA. 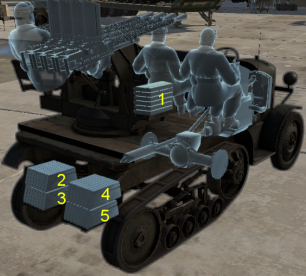 This SPAA's gameplay should be familiar to Soviet rank 1-2 AA veterans: Multiple guns on a truck platform with limited frontal elevation angles. Such a fragile half-track vehicle should be held away from the frontlines and stick to its spawn. Playing this as an SPAA is the surest way to score. 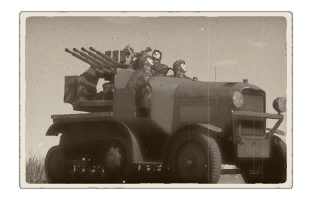 Do not choose this vehicle early game since there are very little planes to shoot at: The P.7.T AA is a second-pick. Do not engage aircraft from too far away since it will only lower your limited ammo reserve while making yourself vulnerable in the event that a plane chooses to strafe you: you do not want to reload while a plane is coming. Another thing to keep in mind is that your gun elevation is limited. Find yourself a steep hill and park on its side in order to elevate your guns at a decent angle. This gun platform's turning rate does not allow for immediate reactions, so always pre-aim your guns to the nearest threat. Ambusher In urban environments and low BR games (when you are facing reserve tanks), it could be a good idea to slip this slim vehicle into a tight alley (engine deck first) near a capture point and wait for an enemy to pass by. Whenever a light enough target falls into your sights, immobilize it by shooting at the engine deck first and then snipe the crew. This tactic is a very dangerous one, more of a last resort than an actual way to score with this AA. It is best used in conjunction with the allied effort: your fire may drag attention from them, turning your enemy's attention from your more potent allies. This tactic is well-suited for RB matches. Avoid artillery at all cost. Another version of this tactic is to leave only the gunner exposed by popping him out (with its guns) from the corner of a building. With its good penetration rates (for an AA) and fast rate of fire, this SPAA can be quite useful to shred light preys. Excellent at actually being an SPAA. A high rate of fire and powerful rounds will shred planes at the rank. Good at suppressing enemy vehicles.